I am hoping you understand the significance of this week's article title! So if you do, my next question is what have you done to connect with your legislators during this recess? If you haven't, you have 2 more weeks to do something! Some of you are already in school so the very best thing you can do is to invite your legislators to come for a visit to see your teachers, students and parents in action! Be sure to get permission for photos and invite the press! The legislators, especially the Representatives, who have to run every two years, are always looking for good press and what could be better than visiting your schools? One of the most important things for you to do is to start establishing or continuing a mutually beneficial relationship with your U.S. and state legislators! Just as we tell teachers to put "tickler" files to make positive comments to their students, you need to have tickler files to contact your legislators — not just to ask for something but to keep them informed of all the great things your staff are doing on a "shoe string" budget! Let them see the results of the federal dollars you do receive! Give them positive feedback! While you are talking to them during this August recess, do ask them to consider the CASE ESEA Recommendations as the Conference Committee works on the ESEA reauthorization. If you don't have a copy of the CASE 2015 ESEA Recommendations, just click here. Also, please mention to them how desperately Sequestration will be effecting your school district budget! Encourage them to ask you questions! And if you get a question you can't answer, tell them you will get back to them on that! Then, contact your state/provincial subdivision's legislative chair, or contact me, or contact Deb Ziegler at CEC and we will get you what you need! We are all in this together and we know relationships are the best advocacy tool/strategy we all have! Speaking of advocacy... I hope this year you will work even harder to work as partners with parents! Parents are another great advocacy tools! Even though you may be a parent, even a parent of a child with a disability, somehow because you are also paid by a school district, your voice is not listened to the same as your parents' voices are! What a great vehicle we all are when we are working together! Michael Remus, our Publication and Products Review co-chair is working now on our next Lucky 21s and one of them is on parent partnerships! Got any good stories? Send them our way! And yet another opportunity! Even though you may have missed the Early Bird registration for the 26th Annual CASE fall conference, it is still a bargain at member price of only $400! That price includes all the handouts, lunches on Thursday and Friday, full breakfasts on Friday and Saturday, and Break on Thursday and Friday, and think of all the networking, too! To see a list of the over 40 breakout sessions, click here; to see the schedule, click here, to register, click here, and to get your hotel room at the Atlanta Hyatt Regency, use the access code: case when you click here! Or go to the CASE home page! When I make a mistake, I do try to admit it like a grown up! Week before last, the Poll asked, "Which of these political issues are impacting you the most now or you anticipate they will in the future?" and I totally read the answers wrong! I am so grateful past CASE and CEC president, Dr. Christy Chambers reads the weekly update and points out interesting issues and occasionally mistakes! The answer that got the most votes was NOT Restraint and Seclusion, but rather FUNDING! If you did read last week's update you know I said I was surprised at the answer ... there was a good reason, I read it wrong! But, it did lead me to select this week's poll which got lots of respondents even though they overwhelmingly gave the same answer! 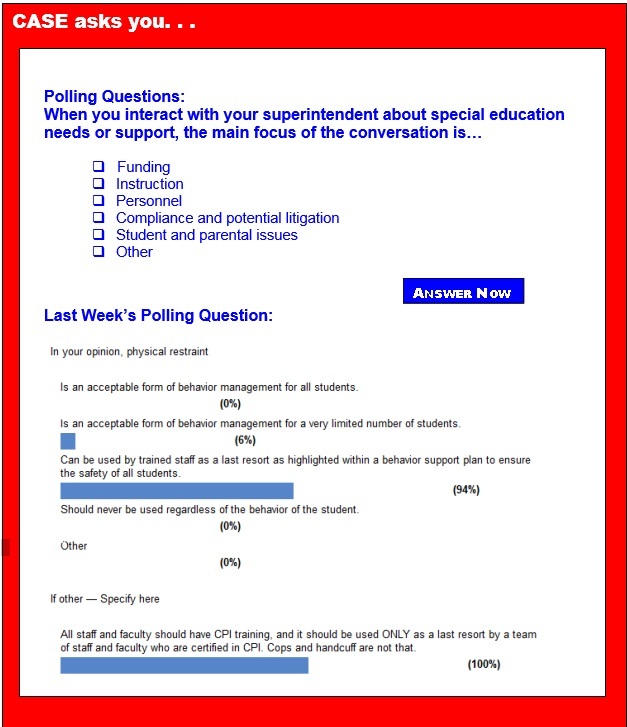 The poll was a fill-in and stated, "In your opinion, physical restraint" ... 94 percent of those answering the poll said physical restraint can be used by trained staff as a last resort as highlighted within a behavior support plan to ensure the safety of all students. The only other answer with 6 percent of the respondents was physical restraint is an acceptable form of behavior management for a very limited number of students. So, thanks for reading the update and keeping me honest! And ... thanks for all you do all the time to make sure ALL students succeed! We write to transmit the attached guidance document regarding the inclusion of English Learners with disabilities in English language proficiency assessments under Titles I and III of the Elementary and Secondary Education Act of 1965, as amended. These are assessments designed to measure the progress of ELs in attaining English language proficiency. The Office of Elementary and Secondary Education in the U.S. Department of Education administers the ESEA, and the Department's Office of Special Education and Rehabilitative Services administers Part B of the Individuals with Disabilities Education Act. Click here to read Questions and Answers Regarding Inclusion of English Learners with Disabilities in English Language Proficiency Assessments and Title III Annual Measurable Achievement Objectives. Click here to read the addendum to Questions and Answers Regarding Inclusion of English Learners with Disabilities in English Language Proficiency Assessments and Title III Annual Measurable Achievement Objectives. There has been a lot of buzz lately in the education world about dyslexia, which affects as many as 1 in 5 children. Dyslexia is a neurological condition that affects fluent reading, spelling and writing skills. Remediating dyslexia requires training beyond what most teacher preparation programs offer. To address these concerns, roughly half of the states in the U.S. have laws relating to dyslexia. Most of these laws require early screening for students and training for teachers. The U.S. Department of Education announced today nearly $14 million in five-year grants to operate 40 parent training and information centers to assist America's families of children with disabilities. The centers will provide parents with details and assistance on laws, policies and research-based education practices for children with disabilities. They will inform parents how data can be used to guide instruction; how to interpret results from evaluations and assessments; and ways to effectively engage in school reform activities. "Parents are crucial to their child's readiness to learn at every step of the education pipeline," said U.S. Secretary of Education Arne Duncan. Thought education might never come up during the Republican presidential debates on Thursday night? You weren't alone. Thank goodness for the Common Core State Standards. After just the briefest mention of education during the 5 p.m. "undercard" debate, the subject finally exploded onto the scene about an hour into the primetime show, featuring the 10 highest polling GOP presidential candidates. Fox News moderator Bret Baier asked former Florida governor Jeb Bush whether he agreed with Secretary of Education Arne Duncan that most of the criticism of common core is due to "a fringe group of critics." As members of the Senate and House of Representatives work to find compromise on their respective overhauls of the No Child Left Behind Act, Americans are expressing agreement with a central tenet in both chambers' proposals: the federal government should have less influence over standardized tests. A nationally representative HuffPost/YouGov poll conducted in early August shows that more than half of Americans think state governments should have more power than the federal government to determine how standardized tests are used in schools. Only 21 percent of respondents said they thought the federal government should have more power than states in this arena; about a quarter said they were not sure. The Justice Department has accused Georgia of segregating thousands of students with behavior-related disabilities, shunting them into a program that denies them access to their non-disabled peers and to extracurricular activities and other basic amenities, including gymnasiums, libraries and appropriately certified teachers. The department's years-long inquiry into Georgia's programs, and the pressure it is now putting on state officials to revamp the way they educate students with disabilities, have brought hope to advocates in the state who have long tried unsuccessfully for change. As technology makes its way into classrooms, the question of what effect innovative strategies will have on students with disabilities remains wide open. In some ways, technology use is nothing new for special education students and teachers. Assistive technology has been a key part of helping disabled students succeed in school and afterwards for decades. But some experts say that the new push for tech-driven, personalized learning environments has the potential to destigmatize their use and provide more opportunity for learning for disabled students. ADHD children often benefit from special academic accommodations established by teachers and parents who spend thoughtful time pinpointing problematic ADHD symptoms, and then devising classroom accommodations that help solve those problems. Following is a list of common challenges faced by ADHD students, and the accommodations that can help bring success at school. A special program for adolescents and young adults with autism spectrum disorder improved their social skills, a new study finds. Because autism research tends to focus on therapies for younger children, the study's attention to this older age group is unusual, said lead author and program founder Elizabeth Laugeson, an assistant clinical professor at the University of California, Los Angeles. Most teens start school too early in the morning, which deprives them of the sleep they need to learn and stay healthy, a new study says. The American Academy of Pediatrics last year urged middle schools and high schools to start no earlier than 8:30 a.m. in order to allow teens — who are biologically programmed to stay up later at night than adults — to get the recommended 8.5 to 9.5 hours of sleep each night. But 83 percent of schools do start before 8:30 a.m., according to a study released Thursday by the Centers for Disease Control and Prevention. The average start time for 39,700 public middle schools, high schools and combined schools was 8:03 a.m., based on data from the 2011-2012 school year. Sorry, boys, but the news only gets worse. Across the board, data show that women are better students than men. From test scores to college graduation rates, females outperform males in almost every metric of educational achievement. Now, two economists from Texas A&M University report that schoolgirls do even better than their male counterparts when they are taught by female teachers. Specifically, the authors found a significant change in female test scores in math — long considered the last bastion of male educational dominance — when taught by a woman instead of a man. Recent news stories about cyberbullying, with kids running away, hurting others and even taking their own lives, points to a growing trend with often tragic results. According to a recent study in the journal JAMA Pediatrics, 23 percent of teens report they are or have been the target of cyberbullying. Another 15 percent admitted to bullying someone else online. The researchers' review of 10 studies that explored the link between social media victimization and depression all showed — without exception — a significant correlation. Yes, cyberbullying undeniably can inflict serious wounds. But from my own family's personal experience, along with research, allowing a teen access to social media can also be a crucial part of recovery from depression and anxiety. Federal funding for autism research yo-yoed in recent years, but ultimately is on the rise, a new government report finds. Between 2008 and 2012, federal dollars for autism research grew 45 percent, reaching $245 million for the 2012 fiscal year, according to the Government Accountability Office. The increase was due in part to the American Recovery and Reinvestment Act of 2009, a stimulus effort in response to the recession, which boosted autism dollars to over $288 million in 2010 before spending scaled back, GAO found. Collectively, 11 federal agencies doled out nearly $1.2 billion in funding for autism research between 2008 and 2012. The vast majority came from the National Institutes of Health.